Foster was diagnosed with rectal cancer a decade ago. His doctor, anticipating surgery, told him that dropping from 230 to 170 pounds would greatly assist his recovery. He lost the weight and, having experienced the fruits of exercise for the first time in his life, has since embarked on many long-distance fund-raising walks. In 1999, a recurrence of the cancer spread to his lungs, but he now has a clean bill of health. 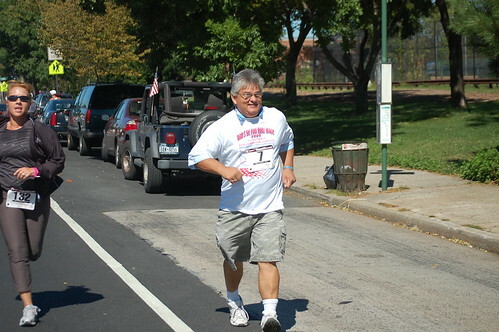 He organizes â€œDanâ€™s 5K Fun Runâ€ for cancer charities from his home in Gerritsen Beach, Brooklyn. When my doctor told me to lose the weight, I was kind of overwhelmed: I didnâ€™t expect heâ€™d ask me to lose that much, and Iâ€™d never even liked running when I was a teenager. But I cut out junk food and started jogging every day, from my house up to the Resurrection Church. Iâ€™d get up there and say a prayer. When I went into surgery, I was 170 pounds on the money. The running probably didnâ€™t do muchâ€”I didnâ€™t run that far! But it kept my mind in a good place. About six months after my surgery, in 1997, I was sitting in a meeting at the hospital, and some nurses and other volunteers were making plans for National Cancer Survivors Day. I said, â€œI think Iâ€™ll walk out to Montauk.â€ It just came out of my mouthâ€”and as I started to think about it, I realized it was probably a little too early to do that distance. When I had gotten back from surgery I couldnâ€™t even make it from my house to the corner. So instead I walked from my parish in Brooklyn to Saint Patrickâ€™s Cathedral, which is around fifteen miles, and did it again the next year. By 1999 I was ready. I walked from the Montauk Point Lighthouse to Saint Patrickâ€™s Cathedralâ€”140 milesâ€”in seven days, starting on National Cancer Survivors Day. After the first day, I put my feet in the pool at the place where I was staying and when I went to get up, I couldnâ€™t. My legs were cramped, and I had to crawl on my knees to a fence to hoist myself up. The next morning, I was walking around in the parking lot and my legs were tight. A car turned inâ€”it must have said on the radio or on TV where I was stayingâ€”and someone rolled down the window and said, â€œLetâ€™s go, Dan!â€ The adrenaline rush â€¦ I wish everybody could feel something like it. It felt like I hadnâ€™t even walked the day before. On my last day, there were police with me, as there had been the whole time. When I started walking over the 59th Street Bridge, I had chills; when I turned onto Fifth Avenue toward Saint Patrickâ€™s, the police put their sirens on. I felt like all of those who had succumbed to cancer were with me. I was walking by myself, but I wasnâ€™t alone. I felt like I could have walked forever. There were people running alongside me, people were honking their horns, some people at Saint Patâ€™s asked me for my autograph. By the time I was done, Iâ€™d raised $20,000 from all the people who stopped on the highway. My wife and I were blessed by Cardinal Oâ€™Connor, and we took a limo back home. When I got back, I think I walked over to the pizza place. My body was still going. Long may you run!!!! Love ya Dan!!! Dan Foster is one amazing soul, God be with him. Run-Danny-Run ——— As usual, good job and keep doing what you do, you are an inspiration to us all. Best wishes to Dan and his family, God Bless on all you do and have done, keep up the fight DAN !!!!! Dan, I didn’t understand how much we are each touched by Cancer, until I met you… You are an inspiration to everyone, young and old alike. I think of the good work you do every time I look in at the “Cancer Memorial Tree” on the Gotham Avenue side of the community gardens beside the library. Thank you.